Over the Berlin Gallery Weekend 2015, the KÖNIG GALERIE takes great pleasure in opening its new gallery space in the St. Agnes Church, now reconstructed by Arno Brandlhuber, with an exhibition of work by Katharina Grosse. 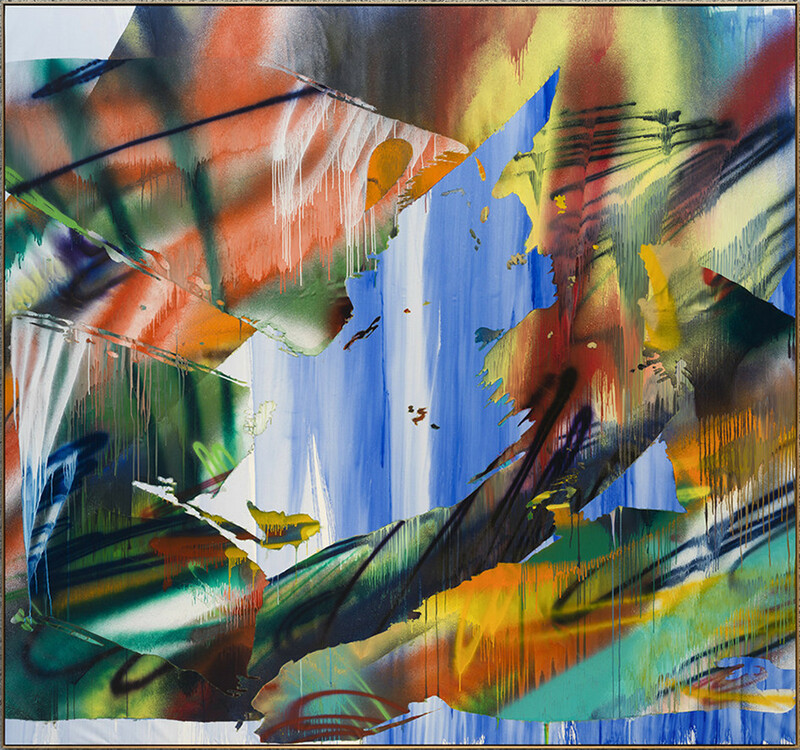 Katharina Grosse stands for colour-intensive, multi-layered, expansive painting, which moves into space, appropriates spaces or opens up spaces for the very first time. With the spray technique characteristic of her, the artist applies colour precisely not only to two-dimensional surfaces but also to undermaterials such as earth and plants, furniture, clothing and architecture. Thus for the 56th Venice Biennale, All the World’s Futures curated by Okwui Enwezor (09.05. 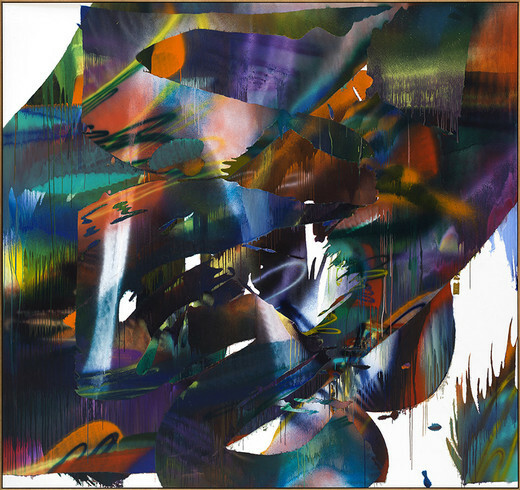 – 22.11.2015), she is creating Untitled Trumpet, a vast-scale, walk-in painting in the Arsenale. In The Smoking Kid, her third exhibition in the Galerie Johann König, Katharina Grosse presents pictures on canvas which seem as if made for the imposing, lofty space in which they are being shown. 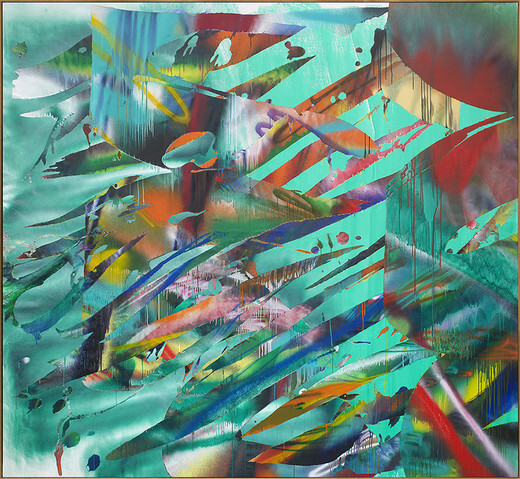 Compressed into the two-dimensional, rectangular format of a panel painting, the works point virtually outward, beyond their material bounds. 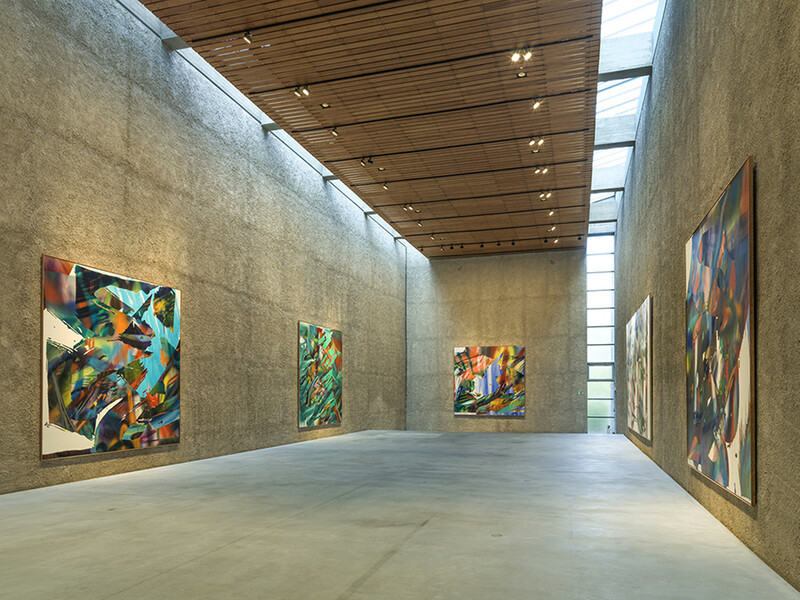 The very suggestion of the possibility of the paintings‘ being infinitely extendable invites the beholder to enter into a corporeal relationship with them, to push off from them, to plunge into them, and so to explore the often enigmatic-seeming illusory space that painterly means have created. The paradox of painting, which resides in the concentration of diverse temporal moments in one single space, is here consciously addressed and taken with verve to its limits. It is hardly possible any more for the beholder logically to reconstruct the ‘making of’ that produced these works. 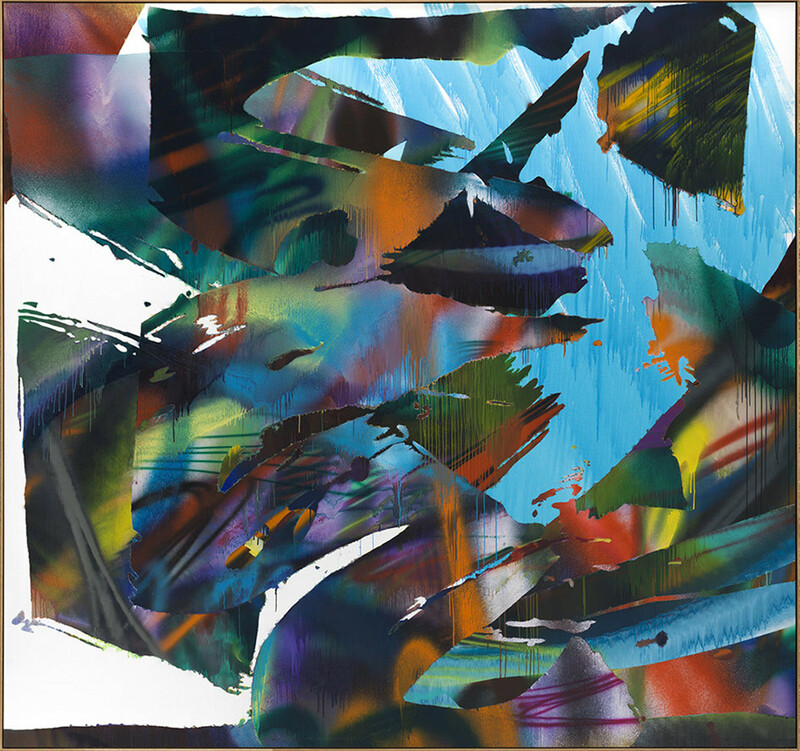 Instead, ‘fissures’ and ‘fractures’ can be seen in the surfaces or between the pictorial layers, confounding perception and provoking questions as to the structural connections between the ostensibly disparate elements here conjoined into a picture. Individual paintings arouse the impression that one is looking at a luminous, digitally animated screen or at a rugged underwater world – movement and possible collision included. The impression is conveyed in part by the bright, radiant backgrounds, against which the often seemingly isolated, sharp-edged regions of picture or colour hover and float like splinters or shreds. The use of templates to cover up parts of the canvas so as to go on painting ‘blind’, is one of the methodological points de départ helping to achieve this controversial effect by which the artist here stages painting anew as feint and sleight of hand, presenting it as a statement against calculated intentionality and outworn (visual) experiences. 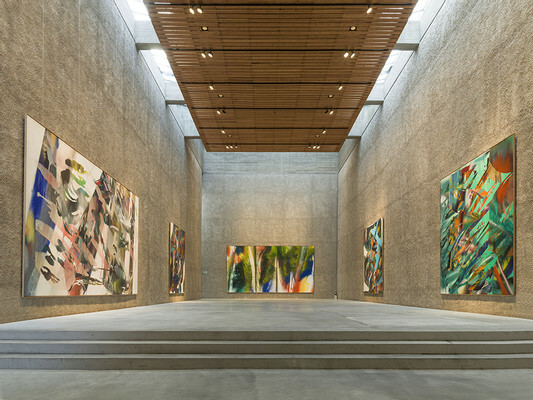 When translated into the specific exhibition situation of these paintings – on display in a listed, brutalist-style church building now reconstructed into a gallery – the result is a gripping constellation of preservation and destruction, an overlaying, a transforming, a re-staging, which, without being precisely so intended by the artist, can be tapped into by each individual beholder and carried on further in the mind. 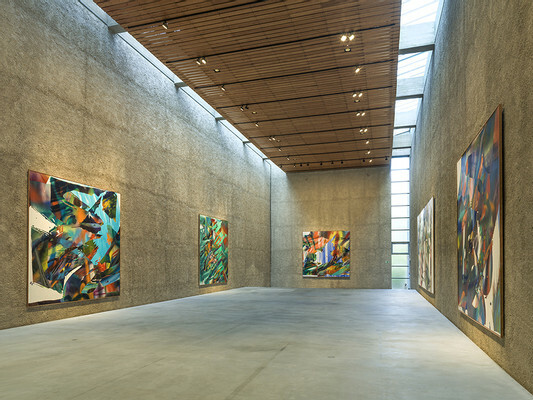 Painted space and real space enter, metaphorically speaking, into fruitful dialogue.